If the 2000’s were where my generation came of age with film, the 1970’s were where my father’s generation came of age with film. I arrived just in the nick of time to be able to claim I was born in this decade of wonder and transformation where the first generation of film school graduates took cinema by storm. Here is where many of my favorite directors working today first made a name for themselves – visionaries like Martin Scorsese, David Lynch, Terrence Malick and Werner Herzog. This was the decade where the prolific Woody Allen and Sidney Lumet reached their pinnacles with Manhattan and Network. This was where directors like Steven Spielberg and George Lucas created the “Summer Movie” and defined the shape of the modern blockbusters. This was the decade where Jack Nicholson became an acting legend with a series of astounding and unrivaled performances in films like Chinatown, Five Easy Pieces and One Flew Over the Cuckoo’s Nest. This was also a watershed decade for the Italians. In the old country Bertolucci tested the limits of aesthetic beauty in The Conformist while Olmni tested the limits of realism in The Tree of Wooden Clogs. And who can forget Coppola’s shaping of the Italian-American pop-culture psyche with his one-two Godfather punch. Madmen auteurs swung high and low, plumbing the depths of creativity and depravity while redefining the outer limits of cinema. Polanski achieved neo-noir perfection with Chinatown but also channeled the insane brutality of the Manson murders (which took away his family that never was) through Shakespeare’s most shockingly violent work, Macbeth. Kubrick dove head-first into dystopia with A Clockwork Orange only to later reach the heights of refinement in Barry Lyndon. Altman created his own genre with Nashville while spinning a web of hipster 1970’s madness in Three Women. Malick swooned with equal parts grit and hazy dreams in Badlands and Days of Heaven leaving himself so dizzy he wouldn’t work again for 20 years, while Lynch (young and scarred by Philadelphia) and Bergman (growing old and scarred by his own legacy) pulled no punches and shocked us to our cores with Eraserhead (an experimental black-and-white nightmare) and Cries and Whispers (a nightmare made of the boldest colors and deepest reds). Yes, my friends. This was it. But nothing…and I say NOTHING…tops the one and only…NETWORK. More than just a scathing satire of the television generation…more than just a foreshadowing of faux reality-based entertainment and geo-politics ruled by corporations and interests in the Middle East…Sidney Lumet’s maddeningly rewatchable and quotable masterpiece is a world-class example of the perfect screenplay (chock full of Paddy Chayefsky’s virile and blistering dialogue that reads like a modern-day Shakespeare full of soliloquies, hot air and biting observations) being handed off to the perfect director at the right time to be channeled by the perfect cast. What Network represents in terms of the possibilities of cinema is an electrified convergence of Theater, Television and Film where one writer, one director, and multiple actors can operate at the echelon of their craft and the sum of the individual parts equals the worth of the whole. It’s corporate…I mean cinematic…cosmology, my friends. And just as important as that convergence, this film had guts…chutzpah. In a decade overrun by big-titted hits, it was Network that quietly, and with an air of class, showed up with the biggest set of balls. I can’t quite remember when I first saw Network. Though I can vividly recall watching it on my tiny 13-inch television in my childhood bedroom when I was just an impressionable kid, I can’t pinpoint exactly when that may have been. All I know is I loved it from the start, and my appreciation for it has only grown over the years. It holds up time and time again. Back in 2006 at the IMDB I attempted to review it. Oddly I called it only the 2nd greatest satire ever (behind Dr. Strangelove) and clearly no screenplay can top the speeches found in Network, some of which I highlighted above. While I remain adamant about how timely it still is, I cringe at the thought of anyone re-imagining it. It deserves to be shown and revisited just as it is…a pitch perfect time capsule of the 1970’s – the greatest decade of modern cinema. This isn’t one of your Scripts, Diana! Network is a blazing, ballsy, and smoothly calculated satire of all things American and Corporate as seen through the tunneled vision of mass market consumerism in the form of television. Made in 1976 with no-nonsense old-school direction from Sydney Lumet and a so-good-it’s-almost-sick script from Paddy Chayefsky, this is not only the second best film satire ever made (behind only Dr. Strangelove in my book) but also a simplistic hologram of what every great film, no matter what the genre, should be: a stone-cold acting, writing, and directing tour-de-force. Faye Dunaway (Oscar winner) is icy perfection as the programming exec who will put anything on TV for higher ratings. 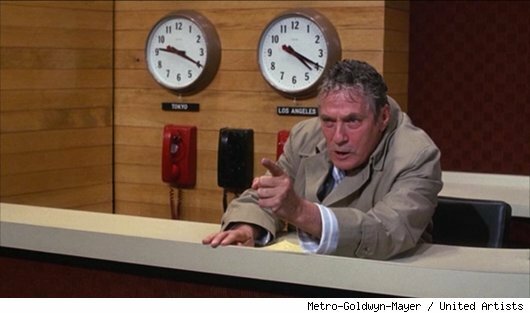 Peter Finch is “mad as hell” in his Oscar-winning performance as the “mad prophet of the airways” spouting off tangents on everything from soulless consumerism to the dangers of MidEast corporate buy-outs (sadly things are still the same thirty years later). William Holden is equally good in his part as an aging and recently axed news exec looking for old-fashioned love in a crazy god-less new world. 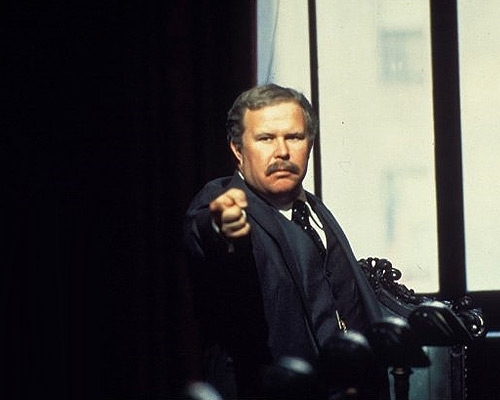 Robert Duvall (with his dreams of big-titted hits), Ned Beatty (with his forces of nature), and everyone else involved are all amazing. This is one of those films so perfectly tailored to its cast and sublimely directed that an actress (Beatrice Straight as Holden’s wife) can walk onto screen for a mere five minutes, exorcise her lines as if this is her death dirge as an artist, and walk off with an Oscar. Then of course there is the writing. This is a film not only of great lines (like “I’m mad as hell, and I’m not going to take this anymore!”) but also of grandiose, verbose, and articulate dialogue (take any of the Dunaway-Holden scenes or the Beatty/Finch showdown of apocalyptic proportions). Only Casablanca, Annie Hall and perhaps Paris, Texas can compete with Network for best film dialogue ever. And finally, this is one of the few classics ripe (and dare I say begging) for re-imagining. In 1976 this was a hilariously dark satire joking about the worst case scenario of a new world order. Viewed today, it’s a horrifying oracle of things that came true. If ever was there a film from the past with a more urgent message, I dare you to name it. This entry was posted in A Decade in Film Retrospectives, Art, Inspiration, Language, Movie Reviews, Movies, Pop Culture, The Lists and tagged A Clockwork Orange, Arthur Jensen, Badlands, Chinatown, Classic Movies, Cries and Whispers, Days of Heaven, Diana Christensen, Eraserhead, Famous Dialogue, Famous Screenplays, Famous Speeches, Faye Dunaway, Five Easy Pieces, Howard Beale, Macbeth, Manhattan, Max Schumacher, Nashville, Ned Beatty, Network, One Flew Over the Cuckoo's Nest, Paddy Chayefsky, Peter Finch, Robert Duvall, Sidney Lumet, The 1970's, The Conformist, The Godfather Part One, The Godfather Part Two, The Tree of Wooden Clogs, Three Women, Top 25 Films of the 1970's, William Holden. Great piece here David. I share your enthusiasm and high regard for Network. I don’t know if I think it’s the best movie of the 1970s, but it certainly would come close if it isn’t. You are right to highlight its perfect balance between the writing, acting, and directing. 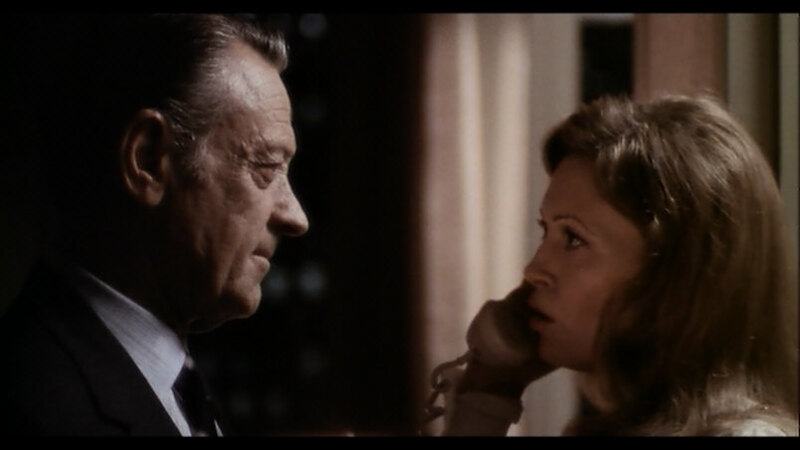 Chayefsky’s script is as close to perfect as they come and Lumet chose the perfect cast, from the big ones like Peter Finch, Faye Dunaway, and William Holden to the smaller ones like Ned Beatty, Robert Duvall, and Beatrice Straight. I look at those monologues and I can’t help but think how both exhilarating and terrifying it must have been as an actor after seeing that on the page. I wouldn’t even know how to begin approaching them, especially the Ned Beatty monologue. That could have gone so wrong with a lesser actor. As for the best of the 1970s, you have several movies I don’t like and several more I haven’t seen. I would add a couple more Altman movies like “California Split” and “The Long Goodbye.” And I’ve always loved “Mean Streets.” It was such a rich decade for movies. How thrilling it must have been for someone like Pauline Kael to be writing about movies then. This celebration of NETWORK is inspired! Lumet’s direction and Chayevsky’s satiric script are long admired, as is the triop of lead performances. This is one of those films, where you find yourself reciting various lines from the film (“I’m as mad as hell, and I’m not gonna take it anymore!”) but it’s quite a harbinger of what has happened and is continuing to happen. My own favorite film for this decade is Bogdonovish’s THE LAST PICTURE SHOW (1971) but I have no issue with this choice. Terrific, passionate essay, David! AMENDMENT: Having just watched for the first time Andrei Tarkovsky’s The Mirror – I feel it certainly deserves a place on the list somewhere. It’s one of those films that requires multiple viewings to fully take in, so I’m not sure how high it could potentially go. It could easily be in the Top 25, maybe even Top 10 after some deeper review. After watching it twice – indeed, a top ten spot is secured for this masterpiece. I have edited the list and placed it at Number Eight. I’m so glad to see so much love for Network, which I consider to be one of the most important films ever made. It’s just as relevant today (maybe even more relevant). I can honestly say that your review is the best I’ve ever seen on this legendary movie. It eerily seems to become more relevant with each passing year, doesn’t it? I mean, isn’t YouTube and all of its channels and original programming now basically the evolution of the “reality TV” concepts this film cooked up? Chayefsky was uncannily prophetic. I still wonder, was it viewed as a comedy when it first was released? Sometimes it’s more like a horror film now. But my god, if it’s anything…it’s perfect. And thanks for the kind words and stopping by The Spin!